In today’s business world, visuals are no longer just a “nice-to-have”, they have become indispensable to presentations and pitches. Gone are the days of presenters spoon-feeding audiences line after line of text-heavy information, that’s almost guaranteed to be forgotten. In fact, statistics show that when including visuals in presentations, audiences retain 55% more information. Here at gallereplay we’ve found cinemagraphs to be particularly powerful visuals when pitching to clients and large groups. In case you’re not familiar with the term: cinemagraphs are an innovative breed of photography that blends together a still image and a video to create a “living photograph”. Not only are they effortlessly integrated into newer versions of Powerpoint and Keynote (click HERE for a step-by-step guide), they also have the unrivalled ability to engage your audience more than static images. Engaging your audience is paramount to any business presentation. An audience that takes interest will be more focused and able to comprehend new information more easily. The unique motion of cinemagraphs can help you break up the monotony of text and captivate audiences. Furthermore, the refined and subtle nature of cinemagraphs means that they are often less intrusive than flashy animations or videos. It’s crucial that your visuals find the right balance between making your point clearly and entertaining your audience. You certainly don’t want your visuals to distract from your core message; it’s about finding a middle ground. Cinemagraphs can help you find that balance, because they are more lively than static images, but less distracting than animations or video. Indeed cinemagraphs can evoke feelings of surprise, wonder and amazement. This increased emotional interest will leave a lasting impression. Do you want to be the presenter that was remembered for your engaging, eye-catching presentation? Or the presenter that was forgotten the next day? Moreover, an emotionally engaged audience is likely to be an easier, more enjoyable crowd to speak to. Another box ticked! OK, if you’ve read this far, chances are you’re interested in new technologies and like to break the mould. Great, because cinemagraphs are a young medium and a cutting edge technology, that’s now beginning to hit the mainstream. Using cinemagraphs will signal to your potential customers that you are a state-of-the-art presenter, well-versed in technology. Business and technology have always gone hand in hand, so why not make use of the tools at hand and give yourself a competitive advantage? The use of visual aids in presentations has been a technique used for decades. In fact, records of professors implementing glass slides and film strips date back to the early 19th century. Fortunately, dazzling audiences with strong visuals is now easier than ever before. 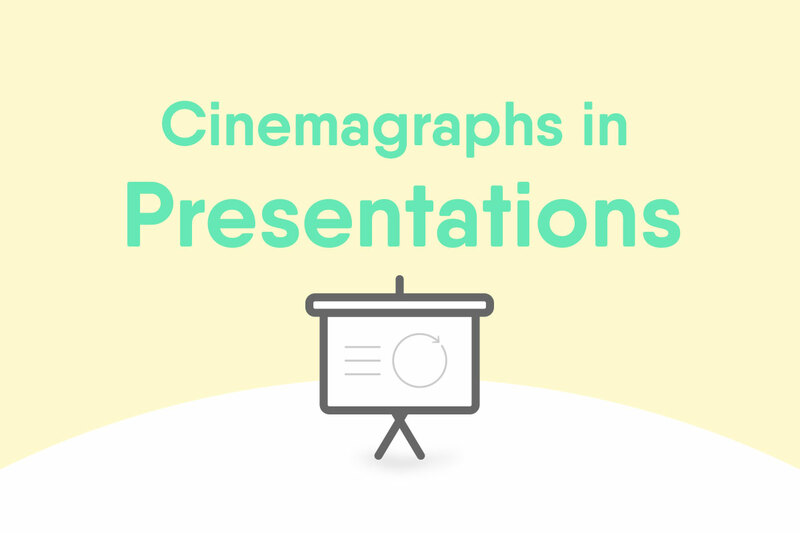 With the ability to easily license stunning high-quality cinemagraphs for your presentation, it’s a great time to try them out…and our collection is a great place to start looking! Happy browsing! Curious about how to implement cinemagraphs in your presentation? Check out part two of this special on using cinemagraphs in presentations: our step-by-step guide detailing how to use cinemagraphs in PowerPoint and Keynote!